Major in Glasgow. The Guardian reveals images of Zaha Hadid's new Riverside Museum in Glasgow, which highlights the machinery, technology, and history of transportation. 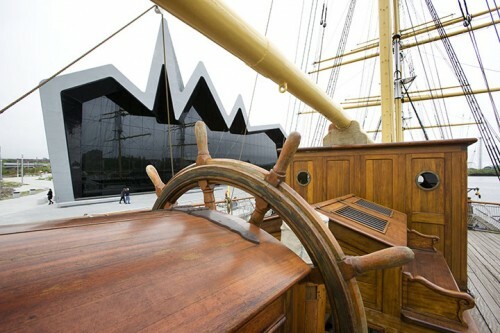 Pictured above, the museum reflects the shipyard structures on its grounds. The Guardian's Jonathan Glancey writes, "Riverside blends into the climate and culture of Glasgow and its riverscape, feeling like part of its great flow of architecture and history." How to be quick. 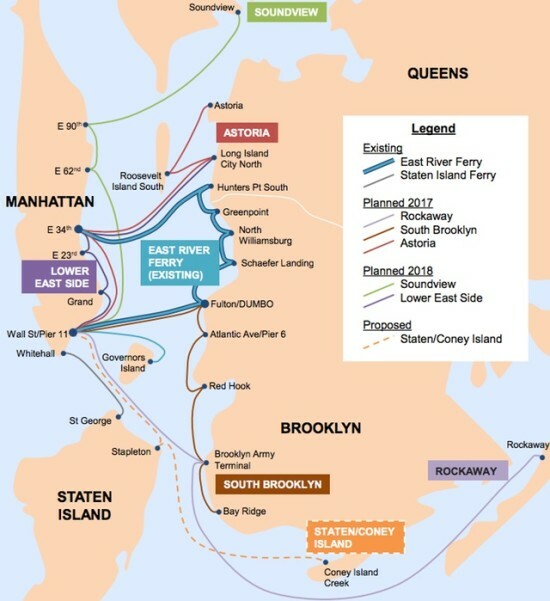 With the new East River ferry, which will be the fastest way to make it to work? To be sure, the Gothamist conducted a commuter race. The ferry was a lovely time to rest but a bit of a steep investment, biking a slightly more dangerous route, while the subway remained the quickest method, getting one commuter to work not only on time but with two minutes to spare. Making Space. SF streets blog shares a new project generously offered to the city by Audi, announcing more to come for San Francisco pedestrians. The Powell Street promenade will bring public space to the commercial downtown, part of a set of P2P (Pavement to Parks) projects to create green space in major cities including San Francisco, Chicago, and New York. The Rome Prize. The Rome Prize fellowship for architecture goes to Lonn Combs. The Rensselaer Polytechnic Institute professor and principal at New York based firm EASTON+COMBS will take the upcoming year to continue to explore the work of Italian architect Pier Luigi Nervi. Congratulazioni! 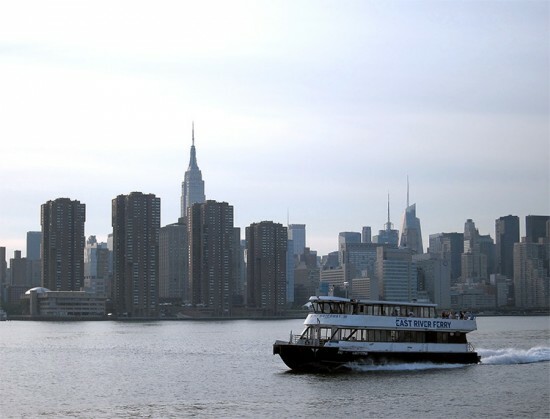 We tried the new East River Ferry service this week and found some of the best views of the biggest projects in town. Though many of the renderings in circulation for developments like Domino Sugar Factory and Hunters Point show views from the river-front perspective, it's rare that you actually get to see the sites from that angle--until now. 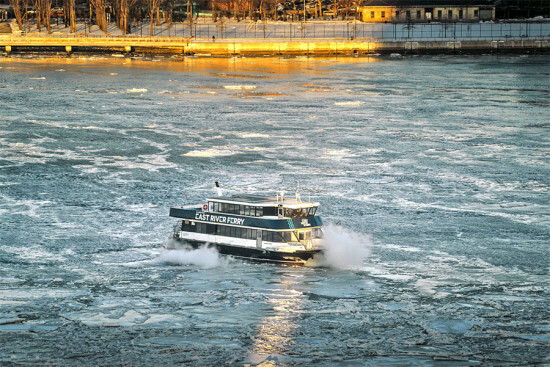 We decided to give the ferry service a test-run to check out the viability of getting from an office in downtown Manhattan, such as ours on Murray Street, to Brooklyn and Queens, then completed the loop by heading back the 34th Street terminal. Taking the MTA bus meant a series of transfers and the subway was about five blocks away from the pier, so we opted to take the Downtown Alliance's Downtown Connection, a free service that loops around the southern tip of the island and drops you right off at Wall Street a block from Pier 11. At the corner of Governeur Lane and Front Street the Korilla BBQ truck beckoned, but the long line of Wall Streeters discouraged us. The boat was waiting when we got there and left the dock in about ten minutes. 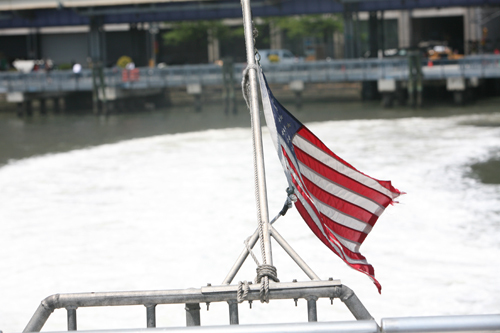 Within about ten more minutes we were docking at Brooklyn Bridge Park and were on our way to four more stops before landing at 34th Street. There, the ferry service runs a free bus loop to Sixth Avenue which wasn't there when we arrived, so we hopped on the M34, transferred and was back in the office in an hour and half from our starting point.